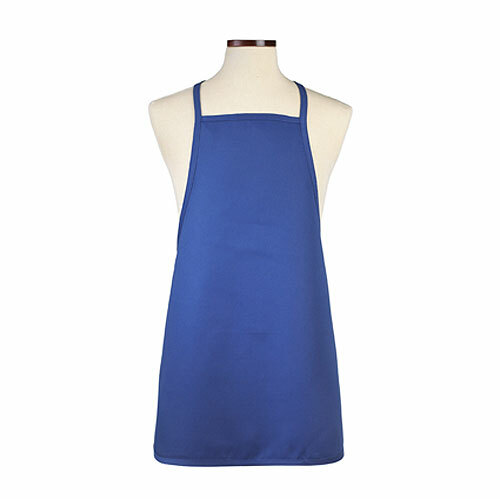 Our standard royal blue bib apron is 24" x 28" and made of 65/35 poly/cotton twill, 7.5 0z fabric. Apron features include an adjustable neck strap, extra long 40" ties and reinforced bar tacking. These aprons can be worn in the kitchen, during demonstrations, at school or more! Take advantage of screen printing, embroidery or laser to customize the 6" x 8" imprint area with your company or event name. Standard short bib apron made of a 65/35 polyester/cotton twill. Extra long waist ties. Embroidery and screen printing available - 8" x 8" imprint area. In stock and ready to ship. 12 piece minimum. Quantity discounts available. Individually poly bagged.